Summer is here and so is the incredible edible zucchini. There are so many different ways to eat a zucchini. I have had it grilled, had it as a bread and I even made noodles with it, which was a lot of fun. Last week I decided I will try them out as a fritter. This is a very simple recipe that comes together quickly. I served it as a side to some Greek seasoned grilled chicken. They had a great crispy edge with a softer center. The mint gave it a refreshing touch in contrast with the feta. Even if you are not a feta fan, I would encourage that you try it in this dish. The strong taste that feta is known for becomes much more mild once cooked and gives the fritter a wonderful flavor. Place grated zucchini in a tea town and squeeze to remove the liquid; discard liquid. In a large mixing bowl wisk egg. Add zucchini, garlic, onion, flour, panko, mint and feta cheese. Mix until well combined. Season with a dash of salt and pepper. Heat vegetable oil in a large frying pan. Scoop 2 tbs of batter, flatten slightly and drop into the hot oil. Cook on each side for about 4-5 minutes, until browned. Transfer to a plate lined with paper towel to drain. Serve immediatly with Tzatziki Sauce. 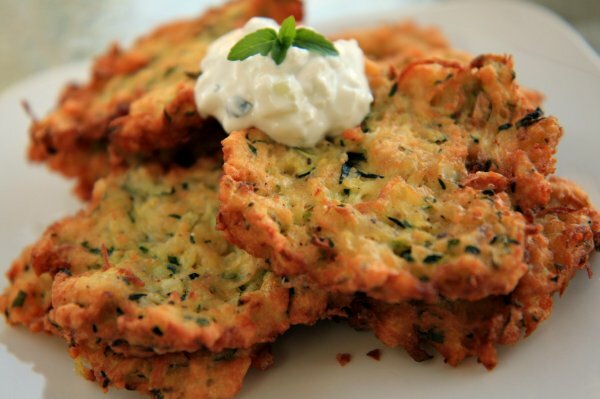 The tzatziki I think is a must have with these fritters. It has a little bite to it because of the garlic and red wine vinegar, yet still refreshing because of the yogurt and mint. If you cannot find Greek yogurt you can substitute it for drained regular plain yogurt. Line a colander with paper towel and pour in the yogurt. Let it drain for 30 mins, until thick. Place the chopped cucumber in a tea towel and squeeze to remove the liquid; discard liquid. In a medium mixing bowl, combine the yogurt, cucumber, salt, garlic, olive oil, vinegar, and mint. Serve as a sauce for gyros. Store in the refrigerator in an airtight container for up to a week. Oh wow – do these ever look good and sound easy enough to make. I just found your recipe today, so I plan to make these very soon. I just know by the ingredients they are going to be the bomb! We love stuff like this so thanks for sharing it! I only discovered your site a couple of days ago and I LOVE IT!!!! to make the best Tzaziki in the world: after chopping the cucumber, put some seasalt on it and leave it for a while, after that squeeze, it will loose more liquid. Adding some creme fraiche/cream and a tablespoon of mayonaise does the rest of the work and using coriander instead of mint is lovely as well. This recipe looks good…BUT, my virus software caught spyware as I clicked onto this site. I’ve been looking for a zucchini cake/fritter recipe – thanks! Just made these last night for the family and they were absolutely delicious. The kids are not really into zucchini but truly enjoyed these yummy fritters. Thank you for the recipe & wish you much success!!! We made this tonight – delicious! It’s our new favorite way to consume zucchini! I don’t know which I love more there, the fritters or the sauce!! I once tried to make that sauce and FAILED miserably!! Wow! These look crispy and delicious! This is a great way to serve zucchini. This is going to be on my table tonight for sure!!! It is simple, yet so delicious!!! Hopped over from Twitter and I’m glad I did. These fritters look amazing! What a perfect way to use all that garden zucchini that’s sure to be flooding our counters very soon. I want them right now! I think I actually have all of the ingredients for the fritters on hand! I’m always looking for new zucchini recipes every summer. Mmm mmm good. Totally yummy. Ever added sweet potatoes in there? Also good! Add sweet potato to a zucchini fritter? Interesting……hmmmm. This is sooo my kind of dish. Ive made this before and it is delicious! I bet tzatziki would be great on it.